Happy Poem in your Pocket Day! I am staying close to home today as huge storms are expected, so I will celebrate quietly this year. I usually carry with me two favorite poems, Kindness by Naomi Shihab Nye and Wild Geese by Mary Oliver. 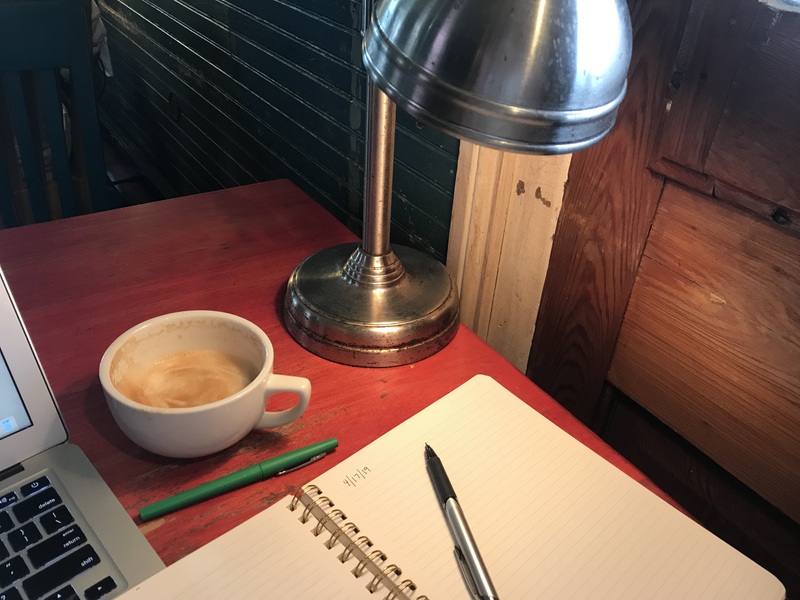 Yesterday I settled into a corner at Fair Grinds coffee in Mid City New Orleans with a vanilla latte and my journal. Christie Wyman is playing along with poetry this month. 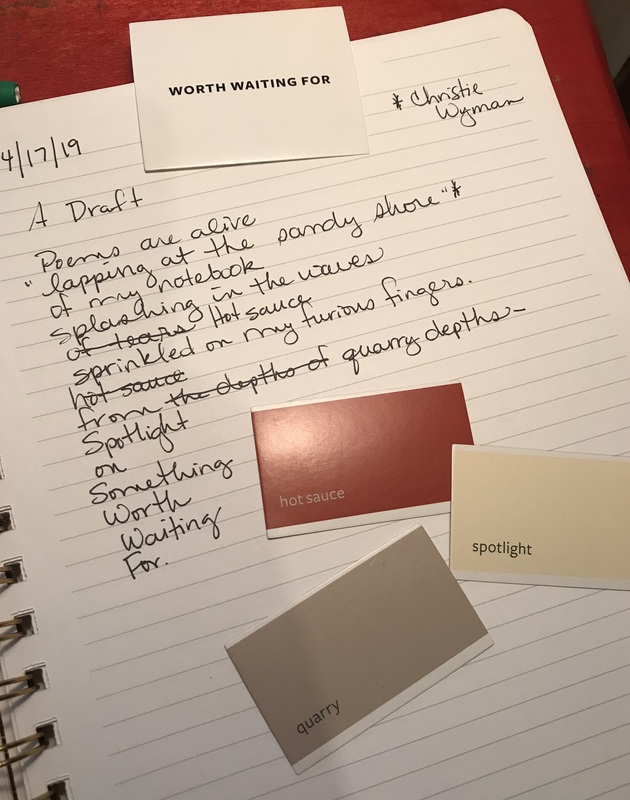 She’d noticed that I often label my poems with the word “draft” and a friend of hers thought that made the poem seem alive. Working with a stolen line, some paint chips, and that alive poem draft idea, I wrote this draft. sprinkled on my furious fingers. This weekend in New Iberia was the third annual Books along the Teche Literary Festival. On Friday, I attended a reading by former state poet laureate and one of my mentors, Darrell Bourque. He brought along accordion artist Mary Ardoin Broussard. Mary Broussard plays the old Creole style of Zydeco music known as La La music. Darrell’s poems from his book Where I Waited (Yellow Flag Press, 2016) are written in the voices of early Cajun and Creole musicians from the 1930’s and 40’s. Cajuns and Creoles in Louisiana spoke French. I don’t speak French, so sometimes I have a hard time following along. I love this music for its dancing beat, but I can’t sing the lyrics and rarely know what they mean. Darrell then spoke of the energy in Golden Thibodeaux’s music. I, however, listened to the energy between Darrell and Mary, making their own kind of music by echoing and honoring the voices of the past. I played in a different way with my own poetry finding new lines within the lines of Darrell’s poem Here and Here. Today I have two drafts written with a roll of metaphor dice. I tend to roll them until I get something I think I can write about. “Truth is a glorified meadow” was a first roll and it stumped me. Before re-rolling, I asked my student Landon what he thought it meant. He said, “It’s like when you have the truth, you have a wide open field of possibility.” Such wisdom in a young 5th grader. I also challenged myself to use the zeno form: syllable count 8,4,2,1,4,2,1,4,2,1 with each 1 syllable rhyming. For the next metaphor dice poem, I used magnetic poetry words to help guide the results. Thursday was a stormy day. 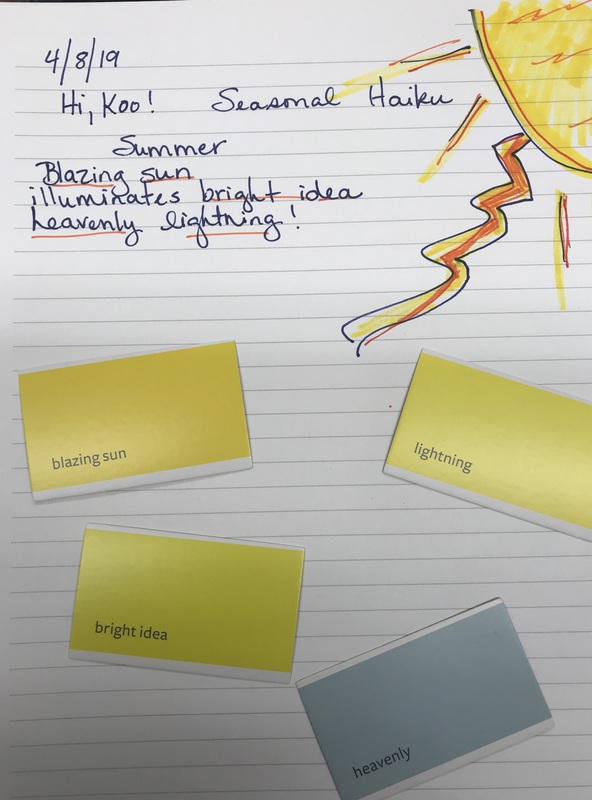 Everyone was talking about the storm, so when we were looking for a topic for a zeno poem, Thunder came through. A zeno poem was invented by J. Patrick Lewis and it follows the mathematical sequence 8,4,2,1,4,2,1,4,2,1, and the one syllable words rhyme. Great time to pull up RhymeZone and do some chatting about word meanings like dire. I then set my students loose to write their own zeno poems while I worked on my own. I tried the haikubes, but there are no rhyming words in them, so it proved nearly impossible to make a zeno. 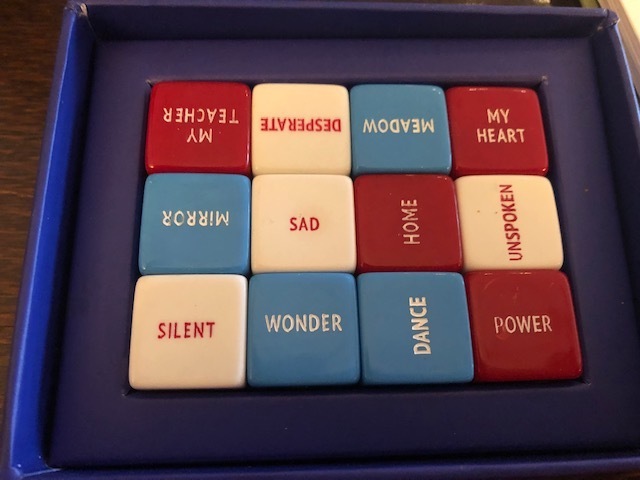 Then I turned to metaphor dice. A little better, but I’m still not completely satisfied with the results. But, as writing partner Molly Hogan stated in her post yesterday, I honored the play of it all. 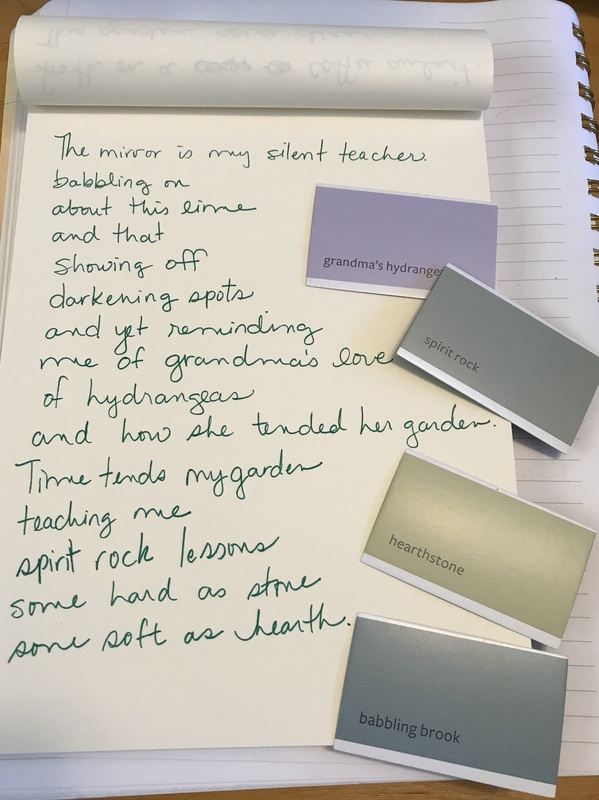 Poetry Friday round-up is with Karen Edmisten. Some of you have been following our wood duck house story. In late February, my husband built a wood duck house and set it up near the bayou. We put a Ring doorbell camera inside to capture the whole process. We were amazed when a hen came in the very next day. It took her a few weeks to lay the eggs and begin sitting on them. I wrote about it here and here. The last time I was able to count the eggs, I had counted 13 eggs. The problem with using a Ring camera is, with the constant motion of a hen sitting fairly consistently, the battery runs down. We changed it out once with no problem, but Saturday afternoon, it had totally died. Because we couldn’t look at the camera to see if the hen was in the house, my husband spooked her when he went to change the battery. She came back for a brief minute then flew back out at around 7:30 PM. After that, nothing. Did she abandon the nest altogether? Alerts to motion come onto my phone. I usually turn off notifications during the night but I didn’t Saturday. We waited for the buzz of the phone. Nothing. She flew up and around the house and landed back in the water. But taking the camera out didn’t prove necessary. I heard a buzz on my phone. She’s back! She was in the box, settling in, poking around, as if nothing had happened. Whew! Relief! Relieved to get this phone alert. Jeff watched one of the videos from the camera and noticed that there was a hen perched at the hole flying out while another hen was in the box sitting. Could they both be sitting? Are they sharing the nest? While our hen was away, I was able to get a shot of the eggs. She hadn’t had time to cover them before she left. I counted 20 eggs! Twenty! If my calculations are right, and the 12 hour hiatus doesn’t change the incubation time, the eggs are due to hatch on or around April 11th. You know I will be posting. You can follow on my Instagram or Facebook page. Now for poetry. 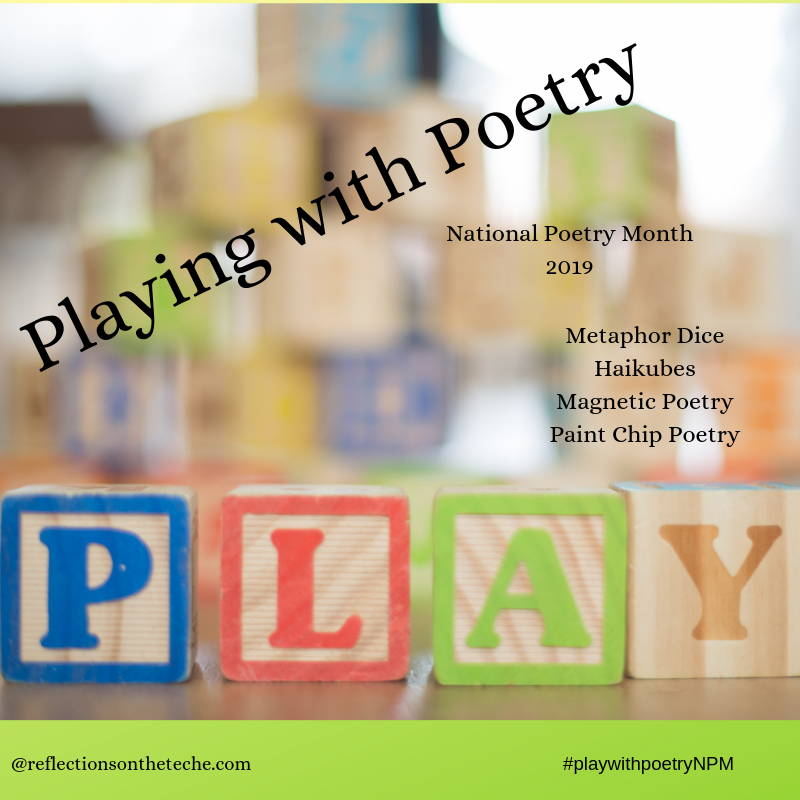 I am playing with some fun poetry games. My students are playing along and posting on our Kidblog site.